I was born with a cancer of the retinas called Retinoblastoma. This led to both of my eyes being inoculated, or removed, before I was two years old. My family raised me to be just like every other child, despite my blindness. They did not shelter me from the devastation of falling, or tripping during play, nor did they allow me to use my disability as an excuse to get out of schoolwork, or chores—though I tried; every child has to test those boundaries somehow, right? I grew up knowing I was strong, intelligent, and that independence and success were mine for the taking. I went hiking, skiing, rock climbing, in school I participated on the Mock Trial and Swim teams, and served as an editor for the newspaper. The only area in relation to my blindness my family did not manage to instill the same kind of confidence in me was independent travel. Blind children have additional lessons they must learn, on top of mainstreamed education standards set forth by the state they live in. Orientation and mobility, or the ability to travel independently with tools such as a cane, is one of them. Between the sometimes conflicting feedback I received from O and M teachers, as well as my family’s warnings to “Pull your cane back, you’re going to hit someone,” or “People are staring at you,” this wasn’t exactly my favorite class. Blind people use canes in a sweeping gesture, or arc across their bodies, from shoulder to shoulder, and extended out in front of them to ascertain that the path before them is clear. When the cane comes in contact with an object, they are then responsible for making a decision as to how to get around it. This means, that by making me self-conscious of tapping people with my cane, my family inadvertently made me hyper-aware of the fact that my method of travel would make others around me, uncomfortable, embarrassed, or inconvenienced. Coupled with the inconsistent feedback I sometimes received, I was much more comfortable going sighted guide with someone I trusted, than I was using my cane. Sighted guide is the method that a person with vision guides someone without vision. A blind person holds the elbow of their guide, in a relaxed and natural position, so as to be walking half a step behind the guide, allowing for reactionary time to what the guide is doing—turning, stepping up or down, stopping. The most important part of guiding someone who is blind is communication and the understanding that each person’s needs are different, and to stay calm, it’s not a test. As an extremely active child and teenager, I still had to use my cane, quite often; but it wasn’t until I attended The Colorado Center for the Blind That I truly began to develop confidence in my travel skills. The CCB is a full emersion training program offering various session lengths, that helps blind people of all ages, develop and hone independent living skills. At the CCB, students are taught by blind instructors, people who use the techniques they are teaching on a daily basis in their own lives. This method of teaching, coupled with firsthand understanding of some of the reasons I was struggling, as well as the freedom and necessity to fully explore my surroundings, led me to trust the decisions I made when traveling and to accept that those around me may be uncomfortable, but I still had to travel if I wanted to get anything done. By the time I finished my training, I was comfortable with getting lost, and with traveling to brand new destinations independently. Despite all this confidence and newly embraced independence, something was still missing. Growing up, I had a few amazing role models that were also blind, strong empowered women that I looked to as second moms and older sisters. These women used guide dogs to get around. A guide dog is classified as a service dog via the guidelines set forth by The American’s with Disabilities Act These dogs have undergone extensive training to be able to alert their handlers of obstacles, changes in terrain, overhanging hazards, crowds, or individual people, and to react to traffic. They are not perfect, nor do they suddenly stop being first and foremost, a dog. They are not super genius live GPS units, (although they are super geniuses) and they are not glorified pets with extra privileges. They are dogs that have been trained to do a job, that changes the life of their handler each and every day, and I wanted to be a part of that amazing experience. The independence, confidence, and ease with which my role models navigated their worlds was something I wanted to experience. I wanted to share the bond that such a partnership can build out of love, and plain old trust. 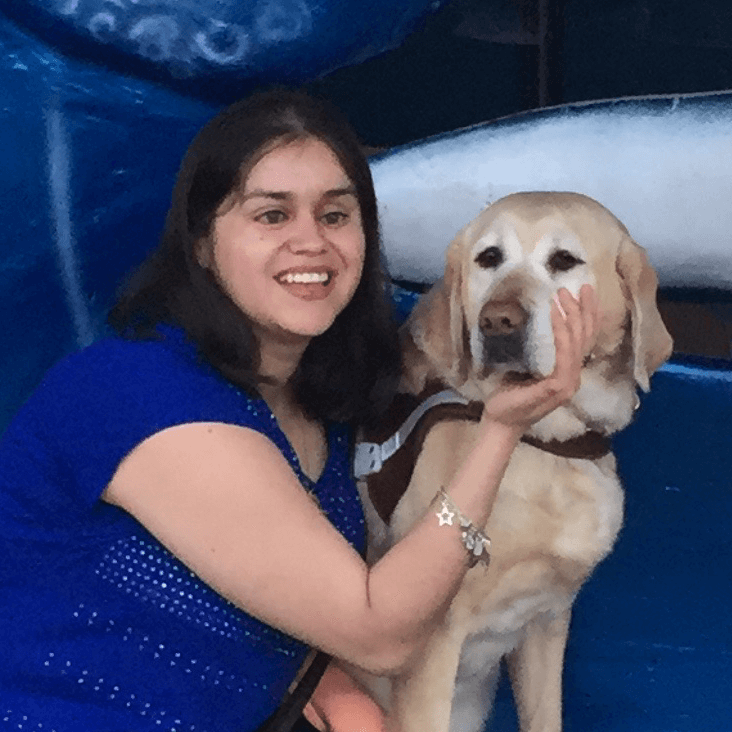 So, after gaining the necessary travel skills from The Colorado Center for the Blind, I applied to Guide Dogs for the Blind and began the process of getting my own guide. After submitting necessary paperwork, which includes medical documents and confirmation from an instructor of your travel abilities, GDB conducts an in home interview to determine whether or not you would be a good candidate for a dog. They note things like, area you live in, your lifestyle, height, walk speed, personality, and familiarity with dogs. Once this stage is complete, you are placed on a waiting list, and the search begins to find you the perfect match. My home interview went amazingly…except for my inability to issue a worthwhile correction. Soon, it was time to meet the dog that would change my world. When I met Marna, I was not convinced she liked me, but I soon won her over with love, treats, and plenty of snuggles. I am pretty sure my reluctance to correct her also gave me points in her eyes. (I am still the softy I was before training, six years down the road, much to my trainer’s dismay.) If I can get around issuing a leash correction with redirection or a verbal correction, I will. Together we learned about one another, and explored the city. Learning to trust her was slightly terrifying, even people acting as sighted guides have ran me into things before, so putting my trust in an animal who cannot communicate verbally seemed a little crazy, but what she cannot say with words, I learned to translate through body language and soul speak. When I went home however, everything went out the window. Almost immediately she needed a vet, as a new handler I was on edge about every little thing, had I broken my dog already? Was I such a terrible handler? After getting her back to a clean bill of health, she began to test me, and test me hard. She wanted to show me that playing with other dogs was much more fun than guiding, and the battle for dominance left me exhausted and discouraged. With the help of trainers, and my amazing puppy raisers, we slowly began to find the equilibrium we needed to operate smoothly, and before long, we were a solid team. The difference between using a cane, and traveling with Marna is phenomenal. While using a cane informs me of obstacles with direct contact, Marna is trained to navigate around them, making the experience so much more flawless and affective. Now that I live in Denver, I rely on Marna exclusively during the winter months, since the addition of snow can take away the texture variation that using a cane requires. This means, I rely on Marna to know whether I am in a street or on a sidewalk when there is too much snow on the ground to feel the difference beneath my feet, or with a cane. She is also trained to find doors, empty seats, and other targets like trash cans, bus stops, and light poles. As I mentioned before, guide dogs are not perfect, and she does make mistakes. For example, at a doctor’s office, I directed her to find an empty seat, and she led me over to a child sized seat. She was technically correct, but it was not exactly what I had in mind. The fact that she can find these targets when given a vverbal command, allows me to save time physically searching for them with a cane. It is also much easier to weave in and out of crowds, or follow someone because Marna is alert of all of our surroundings, not just the space directly in front of me. Beyond the transformation to my travel independence, Marna has brightened my world in so many ways. The people brought into my life, from my amazing instructors, to the people who raised her from puppyhood until she was ready to be trained, to other guide dog users, and every child who stops me on the street to ask “why is your dog wearing that?” only makes my heart sing. Each compliment I receive on her behalf makes me glow inside, because she deserves every single one–except when she forgets herself and jumps up to put her paws on the window of a pet shop to gaze at the puppy in the exact same pose on the other side of the glass. Every time we make it back home after plodding our way through the snow, every time she navigates around unexpected construction, or sidewalk damage, every time we manage to survive something like the Denver Zombie Crawl we grow closer together and the trust we share grows. She’s more than the mobility tool her job classifies her as, she’s my partner and friend. As I trust her to guide me safely through each adventure the day brings, she trusts me to care for her, and make sure that those around us give her the respect she deserves. Born on 10/30/2009 to Sunset and Kentucky, she has one sister and five brothers, all of whom are yellow labs. She was raised parttime on a 200 acre cattle ranch complete with 20 other dogs, 30 cows and plenty of people, and parttime on a plot of land with many other farm animals, where she enjoyed playing with the goats. While her name is an alternate form of Marina, meaning “of the sea,” and although she is a Labrador, she hates getting wet. Her favorite snacks are apples, carrots and peanut butter. When we are in a shopping mall, she always likes to lead me into the most expensive jewlery stores, without any prompting. She’s a sparkle lover at heart. No matter where our life takes us, Marna is up for the challenge. She has accompanied me to concerts, protests, amusement parks, plays, and parades. She makes each new adventure that much more memorable. Always ask before petting a service dog—when you pet a service dog you could potentially be distracting them from their job, which could put their handler in serious danger. Do not be offended if the answer is no—sometimes handlers are in a major hurry, or their dogs are under a lot of stress, and being pet by a stranger is not the best thing for that particular moment. Speaking to service dogs can be equally distracting as petting them—same goes for whistling, making kissing sounds, or simply speaking in the high excited tones many of us use around babies and cute animals. Ask questions instead of making assumptions—all too often I hear parents tell their children they cannot pet my dog because she will bite. That is a falsehood that does a disservice to my dog, the schools that train dogs like her, and the children receiving misinformation. If you don’t know something, ask us. Usually, we’d be happy to share what we know. Please do not feed service dogs—many businesses in Denver have dog treats on hand, which is fine if they ask permission before offering one to the dog. Service dogs are on strict diets to maintain their health and weight, and they are not allowed table food, partly because we do not want our dogs to beg, and partly because we do not know the ingredients of food we do not prepare or buy, and want to avoid our dogs getting sick. It is important to maintain control of your dogs—service dogs are still dogs, with the same instincts and desires as other dogs. While we can keep our dogs under control with commands, corrections and reward systems, it is much more difficult if other dogs are lunging and barking, or coming directly up to them. Remember that not every blind person wants or needs a guide dog–it is each individual person’s choice to make whether their needs and lifestyle requires them to look into acquiring a service dog. No matter what choice is made, it is never wrong as long as travel is done safely and affectively. Both Marna and I are available to visit schools and other events to share our experience, as well as teach general service dog etiquette. About the author: Born and raised in Southern California, I have a love for the beach and not-too-hot-not-too-cold weather. I now live in Colorado, where I’ve sacrificed that perfect weather, but have gained the independence my family taught me to strive for. Along with the determination to reach for my goals, I was taught to love with an open heart, something I think much of the world has forgotten how to do. Together with my adorably playful guide dog, I aim to remind the world around me of the beauty of inclusion, acceptance, and, most importantly, love.